Journal of the House of Lords: Volume 16, 1696-1701. Originally published by His Majesty's Stationery Office, London, 1767-1830. Brook field and Newport Market Bill. Message from H. C. with a Bill. Pyniot & al. Nat. Bill. Countess of Anglesey's Bill, for a Separation. Ly. Say and Seal versus L. Say and Seal. King's Bench and Fleet Prisons Bill. Epus. Oxon. Ds. Custos Magni Sigilli. The House being informed, "That several Persons, who think themselves concerned in the Bill, intituled, An Act for confirming the Grants of Brookfield Market and Newport Market, in the County of Middl'x, do desire to be heard to the said Bill:"
It is ORDERED, That all Persons who conceive themselves concerned therein shall be heard, by their Counsel, To-morrow, at Eleven of the Clock." It is ORDERED, by the Lords Spiritual and Temporal in Parliament assembled, That this House will peremptorily hear the said Cause, by Counsel, at the Bar, on Friday the Second Day of May next, at Eleven of the Clock in the Forenoon; and that, in the mean Time, the said John Deye and his Wife may answer to the Petition of Josiah Thwayts presented to this House the Four and Twentieth of March last, if they think fit; and that the leaving a Copy of this Order at the said Dey's House or Lodgings, and giving Notice of the said Day of Hearing to Dame Susanna Bridgeman (who may be heard if she thinks fit), shall be good Service, in order thereunto. Who brought up a Bill, intituled, "An Act for the more speedy Payment of the Debts of Christopher Killiow Esquire, and for the raising Portions and Maintenance for his Brothers and Sisters, in Pursuance of his Father's Will;" to which they desire the Concurrence of this House. The Lord Viscount Longueville reported from the Lords Committees, the Bill, intituled, "An Act for naturalizing Auguste Pynyot and others," as fit to pass, with some Amendments. Which were read Twice, and agreed to; and the Bill ordered to be engrossed, with the said Amendments. The House was adjourned during Pleasure, and put into a Committee upon the Bill, intituled, "An Act for separating James Earl of Anglesey from Katherine Countess of Anglesey his Wife, for the Cruelty of the said Earl." And, after some Time spent therein, and hearing Counsel to several Matters in the Bill, and ordering them to draw some Clauses to be added to the Bill, upon Heads agreed on by the Committee, and delivered to them, and some Amendments made to the Bill, the House was resumed. And the Lord Viscount Longueville reported, "That the Committee had made some further Progress in the Bill; and desired another Day might be appointed, for them to proceed thereon." 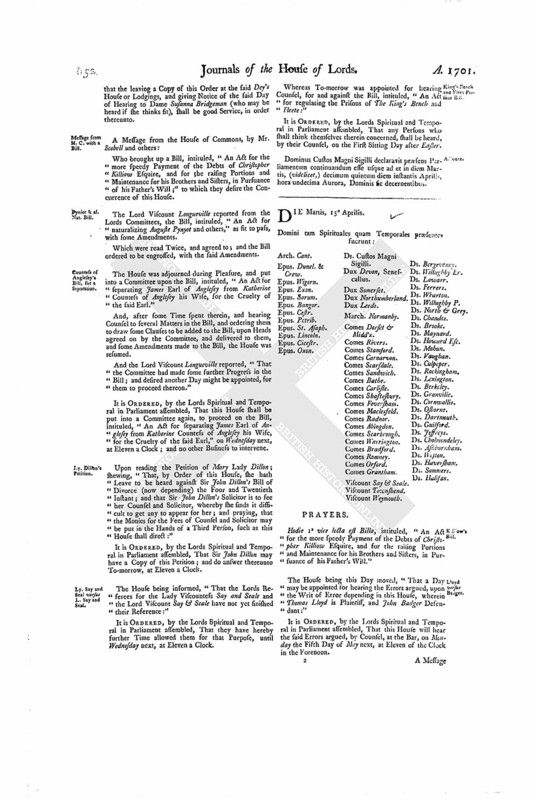 It is ORDERED, by the Lords Spiritual and Temporal in Parliament assembled, That this House shall be put into a Committee again, to proceed on the Bill, intituled, "An Act for separating James Earl of Anglesey from Katherine Countess of Anglesey his Wife, for the Cruelty of the said Earl," on Wednesday next, at Eleven a Clock; and no other Business to intervene. Upon reading the Petition of Mary Lady Dillon; shewing, "That, by Order of this House, she hath Leave to be heard against Sir John Dillon's Bill of Divorce (now depending) the Four and Twentieth Instant; and that Sir John Dillon's Solicitor is to see her Counsel and Solicitor, whereby she finds it difficult to get any to appear for her; and praying, that the Monies for the Fees of Counsel and Solicitor may be put in the Hands of a Third Person, such as this House shall direct:"
It is ORDERED, by the Lords Spiritual and Temporal in Parliament assembled, That Sir John Dillon may have a Copy of this Petition; and do answer thereunto To-morrow, at Eleven a Clock. The House being informed, "That the Lords Referees for the Lady Viscountess Say and Seale and the Lord Viscount Say & Seale have not yet finished their Reference:"
It is ORDERED, by the Lords Spiritual and Temporal in Parliament assembled, That they have hereby further Time allowed them for that Purpose, until Wednesday next, at Eleven a Clock. 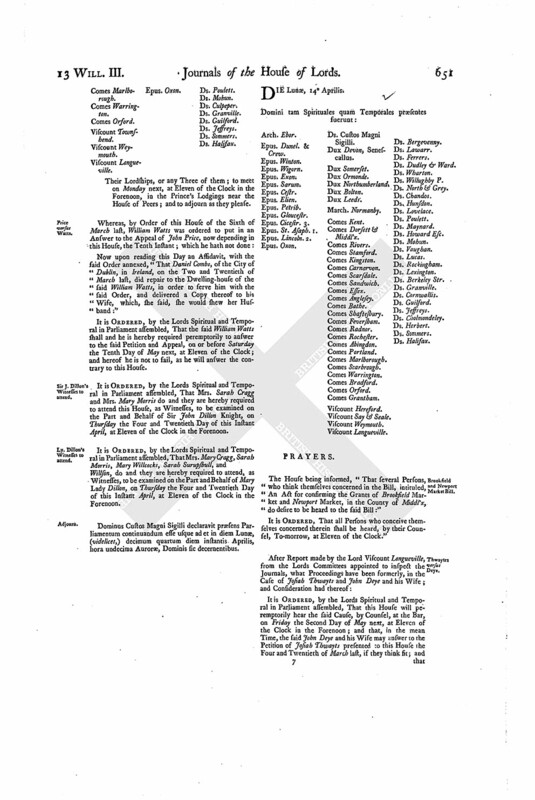 Whereas To-morrow was appointed for hearing Counsel, for and against the Bill, intituled, "An Act for regulating the Prisons of The King's Bench and Fleete:"
It is ORDERED, by the Lords Spiritual and Temporal in Parliament assembled, That any Persons who shall think themselves therein concerned, shall be heard, by their Counsel, on the First Sitting Day after Easter. Dominus Custos Magni Sigilli declaravit præsens Parliamentum continuandum esse usque ad et in diem Martis, (videlicet,) decimum quintum diem instantis Aprilis, hora undecima Aurora, Dominis sic decernentibus.